Whilst I have only been a classic car owner since 1991, my interest and enthusiasm for our motoring heritage goes way back to my very early childhood. I was born in the home town of Watford in Hertfordshire, then the home of Benskins Breweries who had their main depot at the bottom end of the town and this is where my interests began whilst still in my pram – it was here that on many a day come rain or shine, my father would take me to see what was happening, there were always lorries moving about, loading and unloading going about their daily business but I use to find this so fascinating that I would scream when it was time to go home but would always return for further visits. This depot where Benskins were located was used a great deal for the filming of many things but one that sticks in my mind was “The Professionals “ which featured the Ford Capri and Ford Granada as the two main cars, a programme I still manage to watch these days on the cable channels. In my early years, my parents didn’t own a car but my grandparents ( Mums Parents ) had a nice 1965 Ford Anglia 105E (left) and my brother and I used to think it was great to go around in. Of course, the buses were our mode of transport until 1976 when my father passed his test and bought his first car which was a 1972 Ford Cortina MK3 and has moved on through the Ford range and currently runs a nice 1992 Ford Sierra Sapphire. Until I was old enough, I recall when we went anywhere I used to see if there were any transport museums in the locality and pester my dad until he often gave in for a quite life and we visited them, Caister Castle Motor Museum was a regular visit as we used to go up to Norfolk for our holidays and as we visited different places up and down the coast so I used to find more places to stop and check out – great places of interest I would tell my parents not that they were too impressed at times. 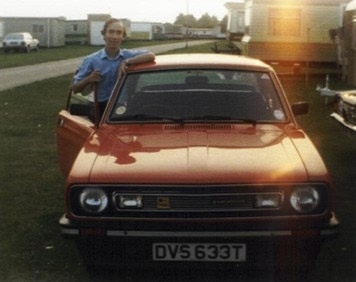 I bought my first car, a 1979 Morris Marina (left) in June 1984 and passed my test a month later in July, although this car had high mileage it had been maintained regardless of cost. Unfortunately in the November of that year, a Triumph TR7 had other ideas when near to home I suffered a bad car accident with my pride and joy being completely written off and very nearly me with it. I replaced this with a 1977 Morris Marina ( Above, Right) which a relative was selling and I thought at least it would fill a gap. I then went on to more modern cars but always thought I might own another old car one day………. 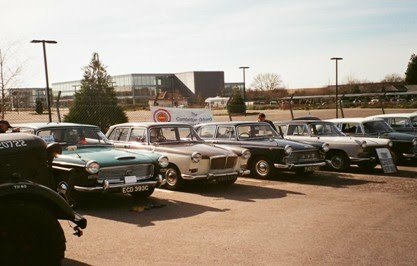 I continued to visit as many museums and other transport days wherever possible, and in 1991 saw advertised in Classic Car Weekly a 1959 Ford Prefect ( Right). I arranged to go down to Dorset and look at the car, a RAC inspection was then carried out and I agreed a price and my father took me down to bring it back up to Watford – this was to be the first time the Prefect had been out of Poole in Dorset since it was bought from Fred English Ford ( now Lex English Ford and no longer on its original site either ) it was in excellent condition having had just one owner prior to me who had the car service every six months regardless of the mileage covered which was very little in any case. The history file that came with this little 3 speed side valve car was very detailed indeed……. A super little car, that I thoroughly enjoyed driving. Having a 1172cc engine meant that I was able to keep up with the traffic, certainly when they were stationary anyway !!!!!!!! Vaccum windscreen wipers, very interesting indeed as if it was raining and you were going up hill then they were not a lot of good to anybody together with crossply tyres made the driving interesting. In 1991 and whilst living in Harrow with my then partner, I joined the Uxbridge & District Vintage Vehicle Society (now known as Uxbridge & District Classic Vehicle Society) and soon attended a number of events they went along to with Club Stands. In 1994, having moved back to Watford we decided to look around for a classic that would be used as a daily run around for my partner to get back and fourth to work. 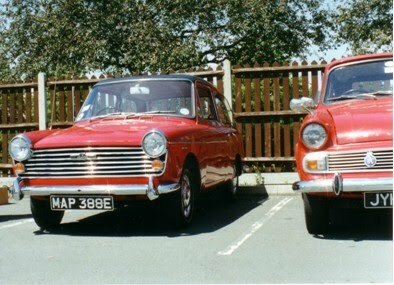 Having looked mainly as the Austin & Morris 1100 / 1300 range and not finding one suitable for what we wanted we saw advertised a 1967 Austin A40 Farina Mark 2 ( Right) in red with a black roof, this was for sale down in Hove in Sussex and so arranged to view the car. On looking at the car, we agreed that this was in great condition and struck a deal. I should now admit that whilst it was bought for my partner to use, I ended up using it as I only worked about 4 miles away and she used the modern car. 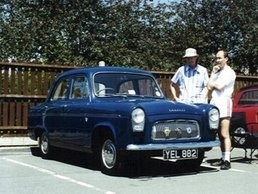 Now, the interesting thing is that both registrations on the Ford Prefect and the Austin A40 were original numbers but also were in exceptional condition. During the latter part of 1994, I saw a small article in the local newspaper from a Watford gentleman who wanted to set up a local multi-marque club – I responded to the article and Doug & I met up to discuss the matter further. Well things progressed with the local papers taking an interest and we decided to form a group called Watford & District Historic Vehicle Register and we had our first formal meeting in June 1995, as interest grew and we gathered more members we changed the name of our group to the Watford & District Classic Vehicle Club which I shall come onto a little more later. Next to the A40 in the picture above you can see part of a 1966 Hillman Husky which until a couple of years ago was owned by long standing members, former committee members and still good friends Brian & Marion. I knew from the beginning that Doug simply wanted to see a new club formed, so during 1996 I took over as Chairman from Doug and this position I held until January 2007 when I stood down at a Committee Meeting. I shall come back briefly to the WDCVC later. 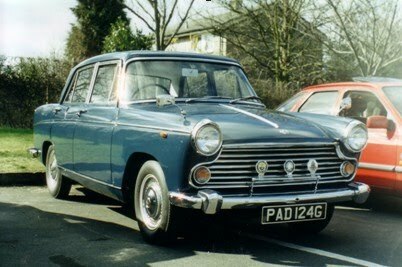 Unfortunately in 1996, due to a change in circumstances, a forced house move and therefore the loss of a double garage, the Austin A40 was sold but only to a colleague of mine who had seen the car and admired it, it now resides up in Suffolk. During the early part of the 1997 rally season, I decided it was time to have a change and so I started looking more seriously at our cars thinking of their suitability for my needs, after all I used to carry around all of the WDCVC stuff and I did use the car other than for show purposes. I admired a car owned at the time by fellow WDCVC member Paul Webb, it was a 1967 Wolseley 16/60 and it was a nice looking roomy car so I joined Paul at a BMC Rally which was held at Nene Park in Peterborough, attending this event I think if I am honest with you is what sealed my decision as to what I wanted to replace the Prefect. September 1997 saw my Ford Prefect leaving my ownership but only moved to its new home across to Bushey which was the other side of Watford; I believe it has now gone over to Ireland. After looking at several vehicles, with Paul in tow I saw a 1968 Morris Oxford AUTOMATIC advertised at a classic car dealer based in Thornfalcon near Taunton in Somerset. I eventually had a phone call from them to say it was available for me to look at it and so Paul and I went down and well the rest is history as they say, I fell in love with it as soon as I saw it. Delighted with my purchase, it was in outstanding condition and an automatic as well – what a catch I thought. So ten years ago in 1997 I joined the Cambridge Oxford Owners Club and remain a member to this very day, this I shall come back too later. As I believe our classic vehicles are for using and not simply showing, from day one in my ownership, I have certainly got the pleasure out of “ Paddy “ attending many shows up and down the Country, taken Paddy to Yorkshire, Dorset several times, Isle Of Wight several times and over to Guernsey for holidays coinciding with rallies or just group trips with the WDCVC or friends and used it for trips out and about during my free time but I must admit it does not go into car parks etc. I bought one of these as I thought it was terrific to see – it soon transpired that he had taken chosen to take a photograph of my Oxford to represent the Oxford in his finished picture of the Farina family. I have a letter from Doug Vince dated 24th April 2002 to confirm this. 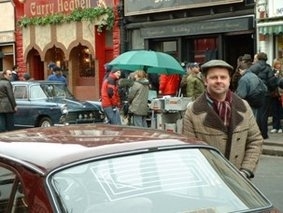 In February 2002, Paddy was used for filming work and appeared in “White Teeth “. This was based in the late 60’s on the novel by the multi award winning Zadie Smith. It was shown on Channel 4 in the October of that year. I was also to star in the White Teeth as an extra in addition to driving my Oxford. It was an excellent day and was a great experience to be involved in and to be paid as well. 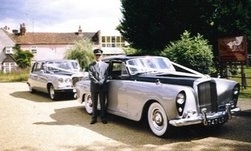 In June 2002, a friend suggested I had a chat with his boss who he did part time chauffeuring for at weekends. This I certainly did and I have been driving wedding cars at weekends ever since, of course its not every weekend and I only generally drive on Saturdays but I have driven cars that I will never ever own but have had the fortune to drive. These are Rolls Royces, Bentleys, Daimlers and a 1932 Austin 12 Heavy. Absolutely great to drive and to be paid for doing so is a bonus. In November 2005, it was used for several days for another filming shot called “Sixty Six “. Filming took place for me in 4 locations, Wembley Stadium, Hampstead Heath Suburbs, Golders Green and Southgate. The story was based on a 12 year old called Bernie whose biggest day of his life was looming, his Bar Mitzvah, and the day he becomes a man. However, Bernie’s family was increasingly distracted by the threat of losing their business and their wayward older son, and the scale of Bernie’s Bar Mitzvah diminished daily. Worst of all the Cup Final is scheduled to take place on the same day and when England makes it through the qualifying rounds, Bernie’s longed-for Bar Mitzvah looks set to be a complete disaster….. I had a great time during those 4 days of filming, spoke to the other vehicle owners but unfortunately I was not able to speak to the other “Farina “ that I had seen as it was brought down from the Manchester area but was a 1967 Wolseley 16/60 in absolute pristine condition, met and spoke to many of the stars including Catherine Tate. This film was for the Cinema, it was due to be released to coincide with the re-opening of Wembley Stadium and the 40th Anniversary of England winning World Cup in 1966. It was finally released in November 2006 and onto DVD, of which I bought a copy. 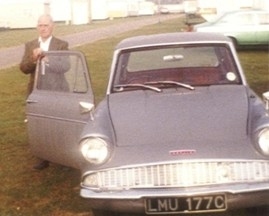 There were a large quantity of vehicles in this and fellow COOC member and friend Dennis Marsh with his 1966 Morris Oxford Traveller also appeared in this film. 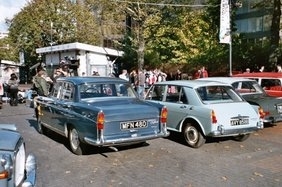 The powder blue Morris 1100 in the picture (Right) was the main car used by Bernie’s father – it was known during the filming as the “Star” car. The company, who contacted me for this filming, said that they wanted the car but because of the year of registration they would place suitable plates over mine and so I became MFN 480, USL 507 and also BOA 430B during the course of the 4 days of filming that I was in. Paddy was the only other car used in the Scene at the ceremony at Golders Green Synagogue. Following the filming last year, I decided it was time to spend some money on the car as the old rust was starting to come through on the wings round the headlights, the usual places on these cars and so it went in during November to Newton Motors based in Potters Bar. This garage had not only been highly recommended to me but I had seen the results of his work before so had no hesitation in taking my car there to be done. The rust was cut out and the necessary repair panels (supplied by EarlPart) were fitted and the area repainted in the same colour, now I was wary of the match but it was excellent to say the least. And so having spoken to Taff Gillingham, our COOC chairman, I offered my services as the Herts Area Organiser. This was taken up before I had a change to change my mind. joined me for the day. A fantastic historical venue, and later in the day many of us took up the offer of a trip round the complex in our classics ending up on the race track for pictures to be taken. I took a lot of photos during the day and certainly whilst my Oxford was parked up on the race track. Towards the end of June this year (2007), I was asked by John Lakey (COOC Publicity Officer) if I would represent the Club at Lords Cricket Ground, after a discussion with John I duly agreed. The occasion for which the COOC had been invited to be involved was for the annual Varsity match between Cambridge and Oxford Universities. The match was first played in the 1820’s. 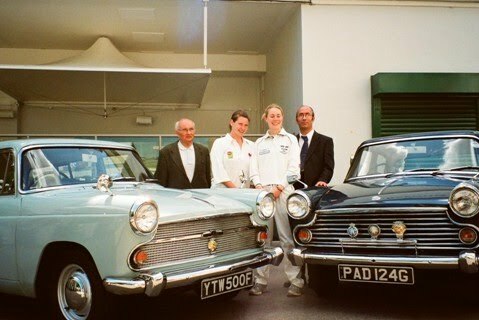 The MCC contact, Tim wanted 5 Cambridges and 5 Oxfords and I had been asked to attend with my dark blue Oxford as it was the colour of the Oxford Team of course. I have to admit that cricket really has never rocked my boat BUT it was to represent the club, we were going to be in a VIP box and supplied with teas & biscuits etc and it was nice to look round the complex too. The Oxford teams both beat the Cambridge teams which was a good result and gave the COOC some good publicity at the same time. The picture shows the two lady team captains, the men team captains were nowhere to be found – WHAT A SHAME !! – with Roland and his beautiful Austin Cambridge Estate and myself with my Oxford. Since this, I have attended the ever increasing excellent Peterborough BMC Rally and then we had a COOC club stand at Alexandra Palace which whilst the overall attendance to the event was not brilliant, it was good for the club to be represented at this prestigious venue. Over the next few weeks I am hoping to be contacting all the existing members of COOC, and those who have not renewed over the last 2 years to introduce myself as their new Herts / North London Area Secretary and advise them of the ideas I have and start organizing Club Stands again at a selected number of shows and a monthly meeting…….. In addition to all of the above which you have now read, I try and attend Bus Rallies as well ! Bye for now, thanks for taking the time to read this.